Members of New Trinity Baroque play on original or historical copies of instruments of the time of the music we perform. We always pay special attention that the instruments we are using are appropriate for the period we are going to perform. We also pay a special attention to the pitch and the temperament appropriate for the repertoire. These instruments are available for hire at reasonable prices. Please inquire for details. By renting our instruments you are helping our goals and our mission. 1) Single-Manual Flemish Harpsichord by David Jensen (Hamilton, Ontario, 2000), after Andreas Ruckers, Antwerp, 1640. This instrument was commissioned in Fall of 1998 by Predrag Gosta, and was finally delivered to Atlanta by Mr. Jensen in early February of 2001. 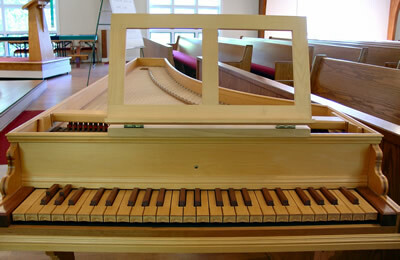 The instrument is an exact replica of the harpsichord by the famous Flemish maker of the 17th century, Andreas Ruckers. The registration of this instrument is typical Flemish registration: one 8' and one 4' register, as well as a buff stop. The compass of the original instrument, which was C-ddd, was expanded by one key (BB), which enables the keyboard player to use the short octave in the bass when necessary, or to simply use one additional note tuned in any pitch (e.g. BB flat) when necessary for the later repertoire. The instrument was painted in the Flemish style, with faux-marble finish and Flemish decorative papers. The Latin inscription on the inside of the cover lid of the harpsichord reads: "Intactum Sileo. Percute Dulce Cano", which in English translation means: "Untouched, I am silent - Pluck me, and I sing sweetly." 2) Single-Manual Italian Harpsichord by Jacob Kaeser (New England, 2001), after Giovanni Antonio Baffo, Venice, 1574. This instrument is a new addition to our instrumentarium. Built by Jacob Kaeser in 2001, the instrument is a historical copy of the Venetian school of late 16th century, based on the 1574 original by Giovanni Antonio Baffo. The registration of this instrument is typical Italian: two 8' registers. The compass of the instrument is C/D/E-ddd (49 keys), with short octave in the low range, and split F# and G# keys. Strings on the Italian harpsichord are all brass; thus the harpsichord is loud enough to cary the whole orchestra, and the chords played are full of overtones which can be easily heard. The instrument was used for the first time at our 2003/04 Fifth Anniversary Season Grand Opening, in September 2003, featuring Vivaldi's "Four Seasons" and other virtuoso concerti (with Ingrid Matthews as a featured violin soloist). 3) Positive/Continuo Organ* with four stops, by Robin Jennings (East Sussex, England, 2003), after 17th and 18th century originals. We are proud to present New Trinity Baroque's continuo organ. This instrument of an exquisite quality is the creation of Robin Jennings, an English organ builder known throughout the world's music community for his quality continuo instruments. 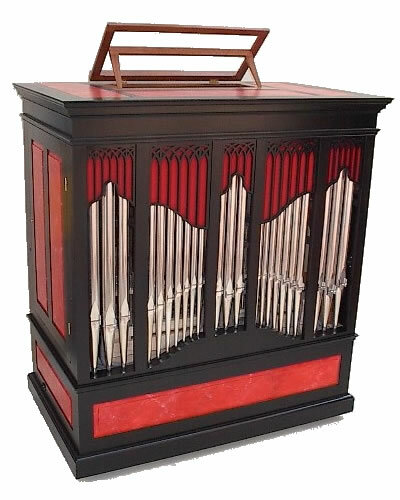 Jennings built this organ in 2003 specifically for New Trinity Baroque following historical tradition of the Baroque period, featuring four stops (Stopped Diapason 8', Chimney Flute 4', Fifteenth 2', Mixture 1' & 1 1/3'), a wooden case painted in red faux-marble effect, and gothic fretwork in old-English style. This instrument has been used not only by New Trinity Baroque, but also by several other orchestras and concert venues, including Les Arts Florissants and William Christie, and Athens Master Chorale. Concert Halls which found this organ suitable for its concerts and featured ensembles include The Schwartz Center in Atlanta, Hodgson Concert Hall (University of Georgia) in Athens, Allen Memorial Church (Oxford College of Emory Univeristy) in Oxford, and many others. The instrument was delivered to Atlanta at the end of May 2003 - and it was featured for the first time at our June concert of Claudio Monteverdi's "Selva Morale e Spirituale". It has four stops, which provide sufficient support for even bigger ensembles, such as a baroque orchestra and a choir. Its ability to change the pitch quickly and easily allows the performer to play at any desired pitch needed for historically accurate performance - as low as 392 Hz (for French Baroque music), 415 Hz or 440 Hz, and as high as 466 Hz (for music of Monteverdi and Venetian composers), as well as "Classical" pitch of 430 Hz (for Mozart and Haydn). 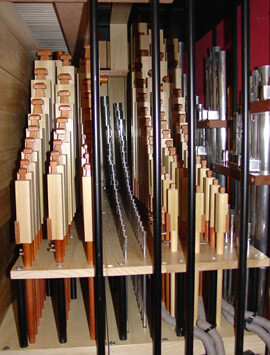 The organ is easily transportable - it has attached wheels, and it splits in two pieces (top and bottom, detachable just under the front-pipes section) so that even two people can lift it. Its blower is the quietest in the industry - perfect for recordings. Beside its fantastic sound, the organ is also visually very attractive! Truly a feast for both ear and eye! Click here to listen to music selections from this and other concerts (MP3 files). Mr. Jennings has many noteworthy names on his list of past customers, including Sir John Eliot Gardiner (Monteverdi Choir / English Baroque Soloist) and Robert King (The King's Consort). Click here to visit his website. 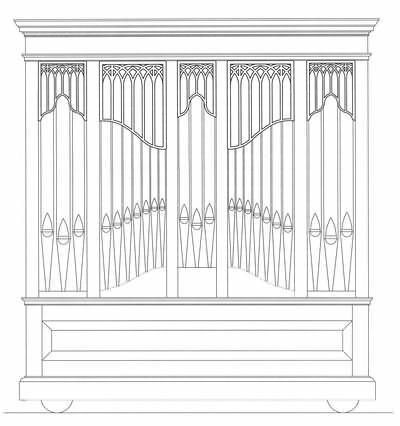 Click here to see the fretwork drawing. for tuning (the picture shows look inside when right door is opened). 4) Baroque Violin by Rudolf Fiedler (Ceské Workshop, Check Republic, 2002), after Antonio Stradivari (Cremona, 1703). This instrument of an exquisite quality was purchased in May 2002, through the Early Music Shop of London, England. The violin was used for the first time in public by Mirna Ogrizovic, in our program "The Italian Handel", on Friday, May 26, 2002. 5) Baroque Viola by Rudolf Fiedler (Ceské Workshop, Check Republic, 2000), after Antonio Stradivari (Cremona, 1703). As the baroque violin featured above, this instrument is of a very good quality. 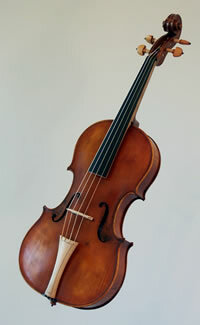 We have several baroque bows, both late 17th century and early 18th century models. *Positive organ for hire (Continuo organ for hire) - Please inquire for details (when sending an email, please put CONTINUO ORGAN FOR HIRE in the subject). This chamber organ is available for hire in Atlanta / Georgia, Alabama, South Carolina, North Carolina and Tennessee. For other states, please contact us to discuss. 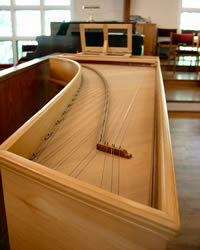 In addition, our HARPSICHORDS are available for hire as well. More information available at www.continuoinstruments.com.